Thank you. Error has been corrected. With the latest withdrawals, we've now passed a milestone: there are fewer than 100 Renaults remaining in service. 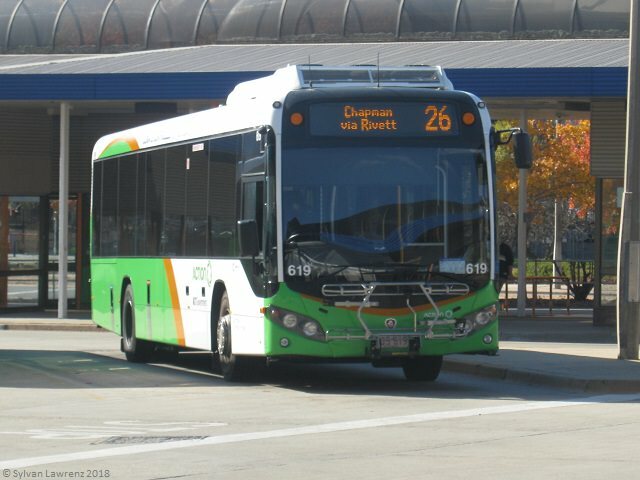 Renault PR100.2 Mkll are shown under fleet in the Transport Canberra site as having standoing capacity of 27 whereas the figure displayed on the rear of buses looked at is 26. The fleetwiki Fleet Specifications page has been updated to include the full capacity (where known). At the moment, we don't have the number for the Renault artics, but might find something in the photo gallery. At the moment, we don't have the number for the Renault artics, but might find something in the photo gallery. Except 61+41≠102. Perhaps the other 8 could fit on the roof? And of course, those are stickers which can be pealed or wear off over time. What it doesn't equal is the 110 I said it did, and that's because I was meant to say 61 seated/49 standing for that model (must've had the Mark II on the mind). Any ideas on why a PR2 just raced past my house (which doesn't even get weekend services) at 10:45pm on a Saturday night? My understanding was all ACTION buses were speed limited at 85kph, but I have recently been on 589 and 615 reaching 92 and 97kph respectively on the Yamba descent on 67N/66N. Are only some buses speed limited, or perhaps it only kicks in with the accelerator and not when the bus is rolling down a hill? On a side note 316 and 368 came past today presumably on driver training duties. Bus 154 was being towed by the tow truck down Cohen Street early this afternoon. Not sure if it's a new vehicle or rebranded but the operations ute 209-828 has a blue TC design. Are the new Bustechs having the 'no entry' sign on the rear door applied? The Tuggeranong ones don't, nor does 621. Last one to get one was 631 (based on photos). While I'm here: something that went unnoticed recently, Scania buses now constitute a little over 50% of the fleet. That's reminding me of the Iris buses, and why 300 was the new numbering instead of 200 or 160. Was that a question or a statement? Because if it was a question, it has been asked and answered before. 712 is diesel electric vehicle which means it runs using a diesel generator to power an electric engine, not unlike a diesel locomotive train. Oh, well that makes more sense now. While I think of it, what's happening with 711, shouldn't it be in use now too? Bus 505 noticed today has a stuck on 2 line notice in front of driver above the front window. It reads "MyWay NXTBUS Interface Test Bus" and "Test Driver Automated Login and GPS Function". Still an active requirement or just a left-over from the MyWay introductory phase? Other test buses? Tram #2 and possibly one or two more might arrive in Wollongong on 1 March. Bus 652 (Volgren/Scania) is due to delivered on 8 March. Bus 711 (Gemilang/BYD) - who knows when it will arrive. Perhaps we should check shipping schedules from Malaysia. For those who missed the memo, 400 is currently partaking in the 2018 Mardi Gras Parade featuring a TC liveried front. Is it likely to retain the TC livery? Have the rest repainted too? Or be painted back into another green front MAN. 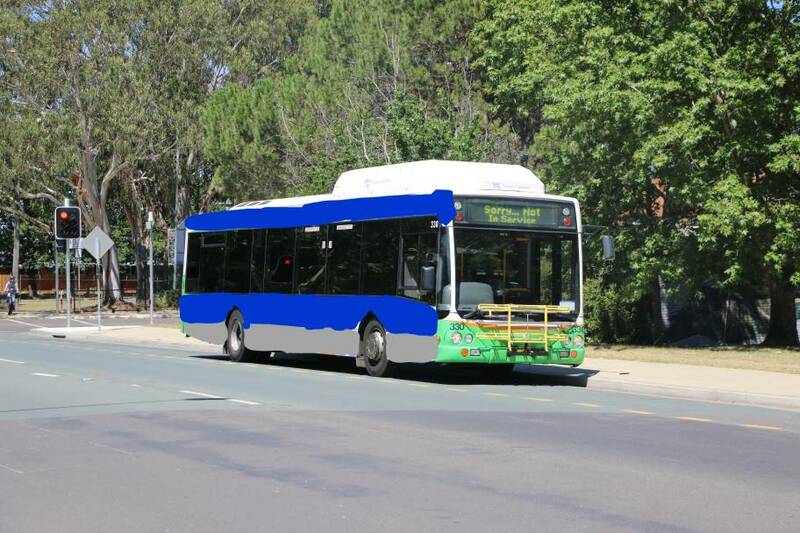 Hopefully it stays in TC blue, it took a bit of effort first get the rainbow colours on Bus 400. Then a Twitter bus logging for the pride of & best bus in the fleet missing TC logos. If it does, it'll look quite the odd one out in the fleet. Is it likely to retain the TC livery? Well so far I can say that its front is remaining the same as I saw it this afternoon with the blue/grey front, with a yellow bike rack. It's We Are CBR AOA is still on it too, so we'll have to wait and see if the full livery will be changed if and when the AOA gets removed. When my mum saw it earlier, she called it 'The Gay Bus' - quite right to. Tram #2 likely to arrive 31 March and possibly be delivered overnight 1 April. Tram #3 may not be far behind; might be on the same ship. 652 & 711 have been delivered. Unknown when either will commence service, but don't expect anything for a few weeks. It doesn't look like it will be the odd one out. 401 looks to be being repainted. It has been spotted in an interim all over white livery with TC front just now. At least no one fell for my lovely paint job on Bus 330. Bit of a wierd one yesterday. Was waiting for my usual 64N at around 2:30pm, which is always an Iribus, when it came up Vosper but with 'Sorry not in service' on its display. Thought at first he forgot to put it up, but when I signalled and he ignored I then thought wtf? To make it even more strange the driver turned left onto Livingston instead of right. 30 seconds later the 712 came around the corner with 64 on its display. I asked the driver what was going on, but he had no clue although the Iris bus was literally right in front of him. The driver asked if the tow truck was with it, and I said no. I was thinking later 'why would you need to bother going back up Vosper to get back onto the Tuggeranong Parkway to go to Belconnen when the switchover of buses likely happened along or before Fincham Cres and it's easier to access it from there?'. Also later on I saw an identical bus sitting next to 710 in T depot so I can confirm that 711 is definitely here. Strange that they're not using them though, cause as I went around and 712 was back in there too. Not sure how unusual, could be many things. A driver specialling somewhere using a random way they felt like going, it could be a driver on route training/familiarisation, could be a mechanic out doing an on road test of a vehicle. Also as a driver I don't understand when people ask where another bus is or why it was late/there/wasn't there, I'm only driving one bus at a time, how would I know what someone elses bus is doing. How was the irisbus "literally right in front of" 712 if 712 arrived on the relatively short Vosper Street 30 seconds later? I was on Bus 431 today and noticed that the short stop switch (in beteeen the single leaf switch and the door demist switch) was flattened (there was no switch) so obviously could not be used. Instead, there was single switch further further towards the windscreen that seemed to be acting as a short stop switch. Anyone know what the story is with the flattened short stop switch? On the MAN / CB60s the switch was moved to be closer to the door buttons, following driver feedback. Couldn't tell you how long ago it was done, but several years at least. Can't talk specifically about these exact buses however the "flattened" button would be a blanking plate, for one reason or another switches can be moved or replaced basically anywhere on the dash of a bus as required by mechanics. Sometimes things fail or have issues and have to be replaced and moved from time to time, usually due to whatever buttons are in stock or what is easier for them to re-wire. Anyone noticed 619 has a different bike rack? So, what's this variation called then? There is a topic specifically for the reporting of bike rack changes (http://actbus.net/forum/index.php?topic=4258.0 ). In addition, it has been mentioned on the wiki entry for this bus. But can you send me the full version of that photo for use in the gallery and the wiki?